Seven-foot vinyl banners are cropping up around town, featuring artful black-and-white photographs. It's all part of a special art project involving local students and the arts center at Caldera. On the placid fall evening of October 9, interested onlookers gathered together at a reception at Navigator News to meet artists, learn about the project, and to see for themselves who's behind those big banners. The project was conceived in Portland, where Caldera Arts photographer Julie Keefe and her family live. Her old neighborhood had once been alive with the goings on of people who knew each other, who felt connected. There were still great people living on her street but they just didn't know each other. Keefe got the idea that an art project involving young people could remedy that. Students could interview and photograph their neighbors, getting to know them and creating a vibrant connection. She brought her idea to Caldera, the nonprofit arts program for children and adults, nestled alongside Blue Lake just west of Sisters. Caldera took on the Hello Neighbor Project and brought it to 11 schools in Oregon, including Sisters Middle School. Sisters Middle School Principal Kathy Miner was early on the scene. "If you feel good about yourself in the arts it blossoms into other areas," she said. "This project serves our middle-schoolers perfectly. It's a great vehicle in their journey of development. In fact, the National Middle School Association promotes all the components that our arts teacher, Kit Stafford, and the Hello Neighbor Project have been doing." During the 2008-2009 school year, Hello Neighbor came to Kit Stafford's Art Discovery class at Sisters Middle School. Stafford is an eight-year veteran of Sisters Middle School. The classes she teaches are funded outside the school system but held within the school day. She's been affiliated with Caldera for a long time. Keefe and fellow photographer Tyler Kohlhoff arrived in Sisters with 30 proven and effective interview questions that had been put together with input from students and a curriculum guide Keefe created. Under the guidance of Keefe, Kohlhoff and Stafford, the students identified, interviewed, and photographed an eclectic group of neighbors. The photo-word portraits that emerged from their work became the large banners now decorating Sisters. Freshman Lindsay Soliz said, "I met a lot of new people and learned a lot about them, it was really cool. When we interviewed my neighbor it was kind of special because it was her birthday. I learned about her family traditions. I liked that. During the interview I realized stuff about me I hadn't really thought of before. It's a really cool program and we were lucky to do it." "Middle-school time of life is just plain awkward. Giving the students an assignment to do helps them cross those uncomfortable places they wouldn't normally go," said Keefe. Hello Neighbor interviewees, fondly referred to by Stafford and her students as Grandpa Harold and Lady Louise, have been in the classroom before as artist-teachers. "This is such an inviting, embracing community," said Louise Jacobs. "We were thinking of moving, but now we're not." "We kind of go to the edge with their art so they feel they're the authority on their art," Stafford said. "Learning the language of art brings self-discovery. Through the arts, the students learn they have something to say and how to say it. They learn to be leaders in their own lives by identifying the challenges and what they want in the future. So we're just navigating the path to get there." 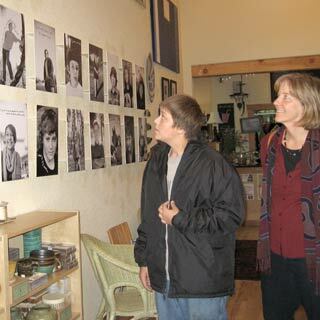 Kirsten Kilchenstein, education director for Caldera Arts, loves this project. "This project is at the heart of the Caldera educational programs," she said. "I love that it brings a voice to the community, that the project is a way to express that voice, it brings people together, and it breaks down stereotypes. We wanted to end the year 2009 with this reception with our own neighbor, Sisters! It makes sense to be here in our own hometown." The banners will be on display outside from now till the middle of December at the Sisters School District administration office, Bedouin, Sisters Bakery, Sisters Market and Bronco Billy's Ranch Grill and Saloon.